What does peer accountability look like? How do we hold one another accountable in respectful, meaningful and appropriate ways? 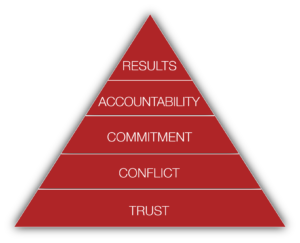 Recently, at a Five Behaviors of a Cohesive Team™ workshop, the team I was working with was focusing on how well they hold one another accountable. They are actually pretty good at it, but there is still tension. They are trying to find the balance between holding teammates accountable and not paying attention to their own accountability–or as we say in Minnesota, watching their own bobber. The work they are doing is important and challenging. I also think it highlights a consistent challenge that teams have. Giving (and receiving) meaningful feedback among peers can be challenging. As often as I hear people say, “I love feedback” I know that what most people mean is that they love to hear that they are doing a great job. When we hear feedback that is critical, it can be tough on a professional and personal level. Hearing that from a co-worker can be even tougher. It is a natural reaction to get a bit defensive and want to explain or rebut the feedback. We ask those we supervise to receive feedback all the time, and we expect them to do it without making excuses. We should expect the same of peers working together. Some leaders actually don’t want their employees giving each other serious feedback. They believe that is a supervisor role. I generally disagree. If team members hold one another accountable in a positive and effective way that frees the leader up to focus on any of the other tasks he or she has to do. Who among us couldn’t use more time? It may take some extra work to create this culture on your team, but the long-term payoff is worth it. The expectation that team members will hold one another accountable must come from the leader of the team. If individual team members try and start giving feedback, they will create negative conflict and disrupt team cohesion. Trust among team members is essential for this to work. If your team is struggling with trust, focus on that first. Feedback norms need to be explicitly stated and team members need to agree to them. There may need to be training provided on peer accountability. Holding a co-worker accountable is different than holding someone you supervise, accountable. It may require additional coaching for team members as they learn and practice giving meaningful feedback to one another. Be prepared to help team members navigate relationships and fix mistakes as this process happens. Along with all other management and team related tasks, it will require focus and maintenance to ensure continued success.